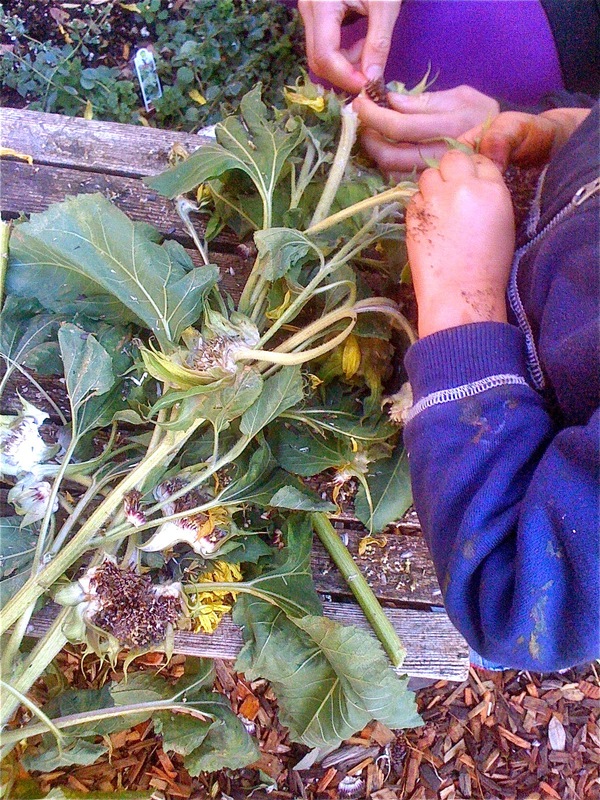 Yesterday, a parent pointed out that her son was eating raw kale that he had picked from the playground garden. "He won't touch it at home, but here, he devours it!" This isn't the first we've heard of this phenomenon at Woodland Park. In fact, we see it almost every day. A couple weeks ago, I mentioned to one of the parent-teachers that we needed to polish off the kale and lettuce growing in one of our raised beds in order to make way for different crops. I wanted her to urge the kids in that direction, but instead, she harvested the leaves herself, then took them to the snack table where she arranged them artistically, like a fan, on a plate. The children were avoiding it like it was the plague. I told her, "If you want them to eat it, try taking it back into the garden." She doubted me, but moments later I spied children queueing up in the garden for their own leaf to munch. When she said, "You were right!" I wasn't surprised because I've seen it so often I no longer doubt it's true. Children are notoriously picky eaters, especially when it comes to vegetables served to them at the dinner table, yet time and again we've seen that most kids, most days, are eager to eat pretty much anything from the garden. No one is surprised when kids fall on the berries, but our chives are almost as popular. We eat green beans straight from the vine, the seed pods of radishes that have bolted, and green tomatoes because we are so eager we pick them before they're ready. 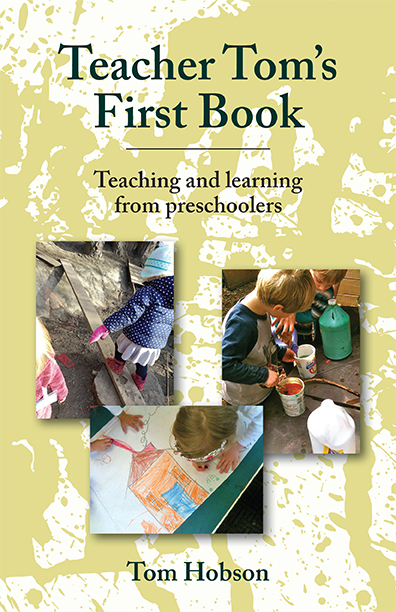 A pair of boys once ate an entire crop of immature beets straight out of the ground causing their parents to panic when they later produced red urine. We've eaten a whole eggplant, raw. And when they are done, they beg for more. 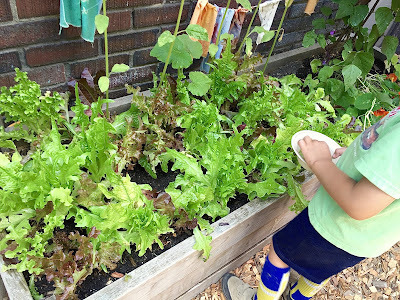 Occasionally, a parent will report that this new adventurousness about vegetables has carried over to home, but more often than not it doesn't: they'll eat the kale from the garden, but not off a plate. I recognize that there is a lot at play in food pickiness, including power dynamics, but I've begun to suspect that this reluctance to trust unknown or unusual food is at least in part an aspect of ancient wisdom, an evolutionary trait that helps to insure survival. I mean, it makes sense to be instinctively suspicious of new food that just appears on your plate, that was previously displayed at a supermarket, after having been transported on a truck or a train or a plane from a different state or even another country. It's adaptive, I think, to want to know where your food comes from, to have seen it grow, to have watered it, and then to have picked it yourself. I wonder if the pickiness of children around vegetables isn't due in part to our modern system of producing and distributing food. We like to know where it came from and there is no surer way to know than to grow it yourself. Of course, this doesn't explain the popularity of hamburgers and chicken fingers, because, honestly, if children knew how those things are made, they would likely swear off them forever. Still, it seems like a plausible theory when it comes to veggies and is an argument for every child having access to a vegetable garden.